Now updated, with many products added. You can look forward to our brand-new quick coupling system ST-247, which allows for replacement of accessories on existing high-pressure cleaning systems with just a click. The 15 different K-Lock adapters now ensure that you can continue to select your articles from our vast product range. With our hydroblade® accessory sets, you benefit from a sharp, uniform flat jet with an extraordinary jet depth and utmost performance. 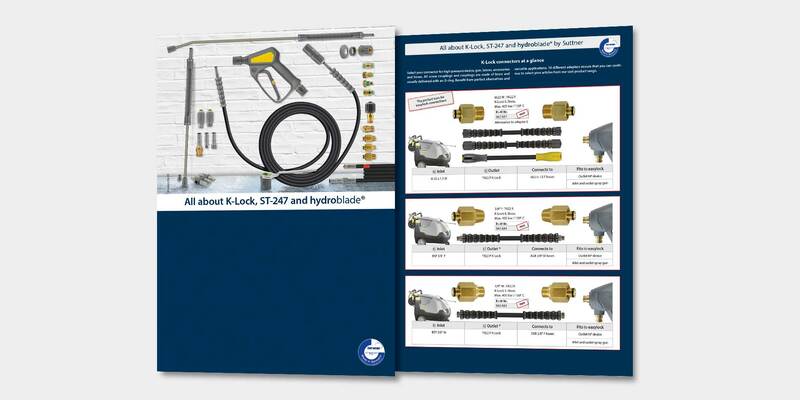 For detailed information and connection examples regarding our new K-Lock, ST-247, and the hydroblade® nozzle system products, please refer to our leaflet.